Off Buena Vista Drive, between Disney's Coronado Springs and the All Star Resorts. 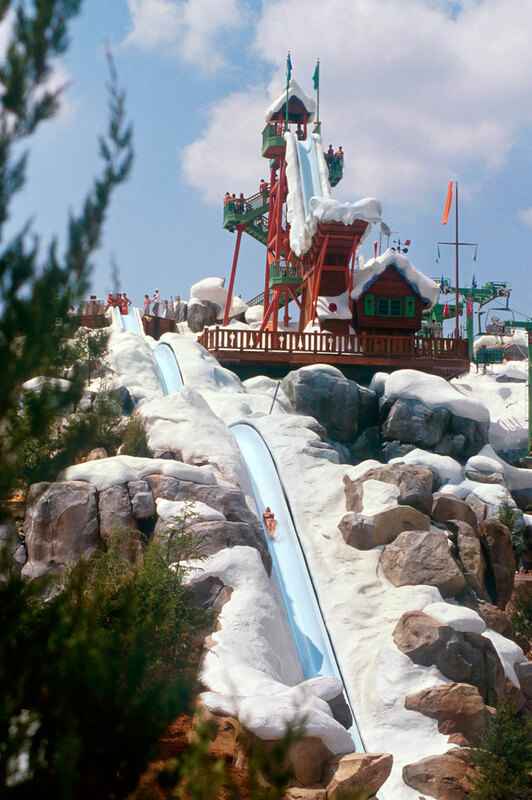 Blizzard Beach in a winter resort-themed water park featuring wave pools, splash parks, restaurants and bars, and exciting thrill slides for all ages. There are four levels to the park: Ground Level, Red Slope, Purple Slope, and Green Slope. The Ground Level is home to lounging areas, the massive Melt-Away Bay wave pool, dining service like Lottawatta Lodge, and drink stations, like Polar Pub, where guests can cool off with mixed drinks, beers, and sodas. The Cross Country Creek is a lazy river that winds through the ground level, allowing guests to lounge and ride through 3,000 feet of slow moving water. Other ground level areas include Ski Patrol, a pool area for pre-teenage children with water obstacles, short body slides, and a pool where guests can hop from iceberg to iceberg. Tike's Peak has gentle slides and a snow castle fountain for children under 48 inches. The Chairlift is a one way ride to the top of Mount Gushmore for those who don't opt to take the stairs and ramps up. The Red Slope is the next level of Blizzard Beach and is home to one attraction: Runoff Rapids. This inner tube run has two open slides and one enclosed one. The attraction is accesible by stairs only, and unlike the Purple Slope attraction, is not designed for racing. The Purple Slope combines water park fun with competition. It contains three racing slides. The Downtownhill Double Dipper has side-by-side slids that guests can race down. Guests travel up to 25 mph on twin inner tubes as they race down the 230 foot long slope. Snow Stormers is a mat slide with three flumes where guests ride now on their stomach in a toboggan style. Toboggan Racers is another mat slide where guests race to the finish line down snow slopes. The highest area of Blizzard Beach is the Green Slope, on top of Mount Gushmore. The Green Slope houses Summit Plummet, the highest free sliding body slide in the United States. Summit Plummet is 120 feet tall and sends guests downward at speeds up to 60 mph. Slush Gusher is another free body slide that reaches speeds of 35 mph. Last, there's Teamboat Springs, a multi-person raft ride that holds 4 to 6 people and is the world's longest family raft ride. The water at the park is heated year-round between 75 to 80 degrees Fahrenheit. Lockers and towels are available for rent at the park. Life jackets for children and showers are free to use. 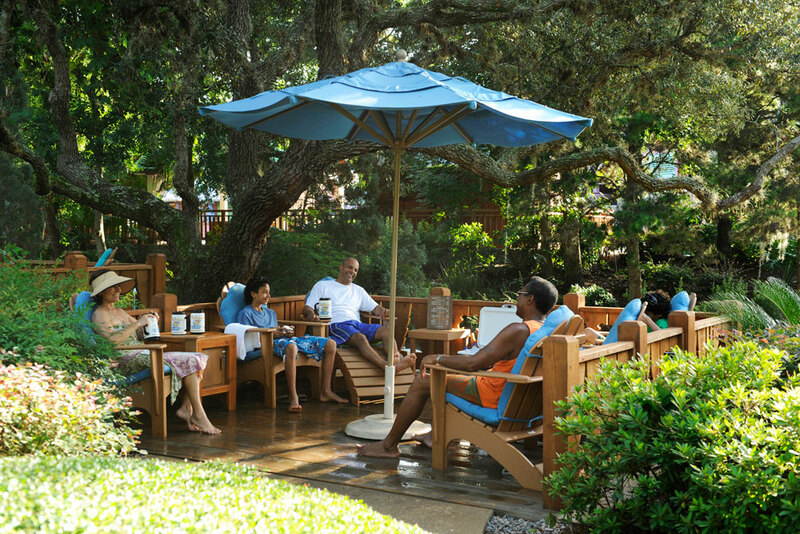 Special private patios for lounging may be reserved for an additional fee. Blizzard Beach is open for nine months from April 1 to December 31. From January 1 to March 31, the park closes for annual refurbishments. Blizzard Beach is located off Buena Vista Drive, between Disney's Coronado Springs and the All Star Resorts.